eCite - Is there an optimal board size? Is there an optimal board size? 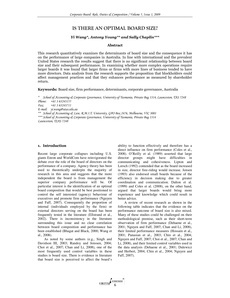 This research quantitatively examines the determinants of board size and the consequence it has on the performance of large companies in Australia. In line with international and the prevalent United States research the results suggest that there is no significant relationship between board size and their subsequent performance. In examining whether more complex operations require larger boards it was found that larger firms or firms with more lines of business tended to have more directors. Data analysis from the research supports the proposition that blockholders could affect management practices and that they enhances performance as measured by shareholder return.